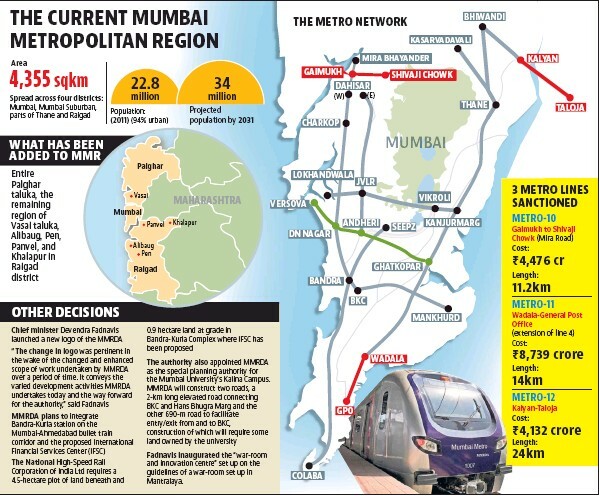 The Mumbai Metropolitan Region Development Authority has approved the detailed project report for three metro rail corridors, besides the incorporation of more areas in its jurisdiction to push growth on the outskirts. 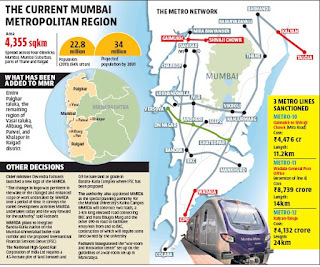 The DPRs were for the Rs.4,476 crore Metro 10 from Gaimukh to Shivaji Chowk in Mira Road, the Rs.8,739 crore Metro 11 from Wadala to CSMT, and the Rs.4,132 crore Metro 12 from Kalyan to Taloja. “All the three DPRs will now be recommended to the state government for approval,” a spokesperson said. The MMRDA approved the inclusion of the Palghar, Vasai, Alibaug, Pen, Panvel and Khalapur talukas in their entirety in the metropolitan region. It said the decision would help develop these parts in a planned manner. The decision was taken in a meeting chaired by chief minister Devendra Fadnavis. “These areas have tremendous development potential and are prone to fast unplanned growth if left as it is,” he said. “This decision will now see these regions ... sustain development on their own.” There will be emphasis on development of “growth centres”, which is expected to work as a catalyst for development. The MMRDA decided to establish the Mumbai Metro Operation Corporation Ltd as it expects to throw open the Metro 7 from Dahisar (east) to Andheri (east) and the Metro 2A from Dahisar to DN Nagar next year. “The corporation will be an autonomous body and will deal with operation and maintenance of Metro Lines as also Monorail,” the spokesperson said. Fadnavis launched the MMRDA green policy for metro lines to optimise energy use. The MMRDA decided to integrate Bandra-Kurla station on the Bullet train corridor and the proposed International Financial Services Centre.